Famous for historical landmarks such as Corregidor Island, Mount Samat, Bataan Nuclear Power Plant and Las Casas Filipinas De Acuzar, Bataan is a province that lies in the middle part of Luzon, adjacent to Zambales and Pampanga. Tourists can also take delight in their wonderful beaches as well as taste popular Araro cookies, which is a native delicacy based on flour and egg that is available at Manuel’s store, in Samal. #1 - The Oriental Bataan: Conveniently located in Bataan, The Oriental Bataan is a great base from which to explore this vibrant city. From here, guests can enjoy easy access to all that the lively city has to offer. With its convenient location, the hotel offers easy access to the city's must-see destinations. #2 - Miami Heat Beach Resort: Spend beautiful time with your family or buddies at luxurious Miami Heat Beach Resort, located in Barangay Nagbalayong, Morong. Have a ball with the stunning sunset view, strolling on the beach sand, swimming in the ocean and open air pools, jet skiing, banana boat riding, etc. Not to mention, experience the comfort of their accommodation with amenities such as cable TV, relaxing bed, air conditioner, etc. #3 - The Duyan House at Sinagtala Resort: This resort is a tranquil oasis located in the mountains of Orani, Bataan in Central Luzon. Only a short 2.5hr drive from Metro Manila, the resort offers guests a private mountain retreat that fully respects and embraces its natural environment. Bordered by Mt. Natib and the tropical rain forests of Bataan National Park one one side, and by Mt. Arayat and the plains of Pampanga on the other, The Duyan Resort offers guests an idyllic setting with stunning scenery and breathtaking backdrops. 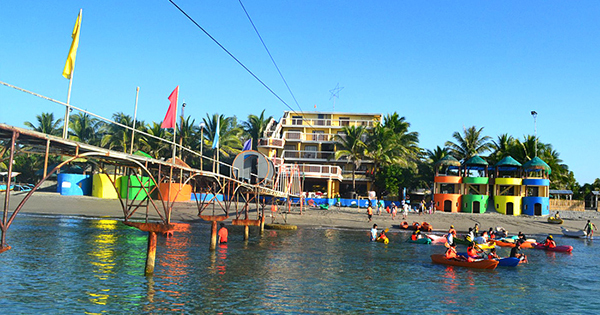 #4 - Vista Venice Resort: This establishment is famous within the region as a haven for adventure-seekers and nature-lovers. They take pride in giving their guests the ultimate “WOW” experience again and again as we offer these amenities that makes Vista Venice Resort a one-of-a-kind tourist destination.